10 Baby Food Myths Busted! If your little one is ready to start solids, you ought to read this article! After six months of exclusive breastfeeding, mothers are often confused about which semi-solid foods they should introduce to their little ones. Sometimes, too much research can be a bad thing and after reading about a million articles on the Internet, mothers are left more confused. 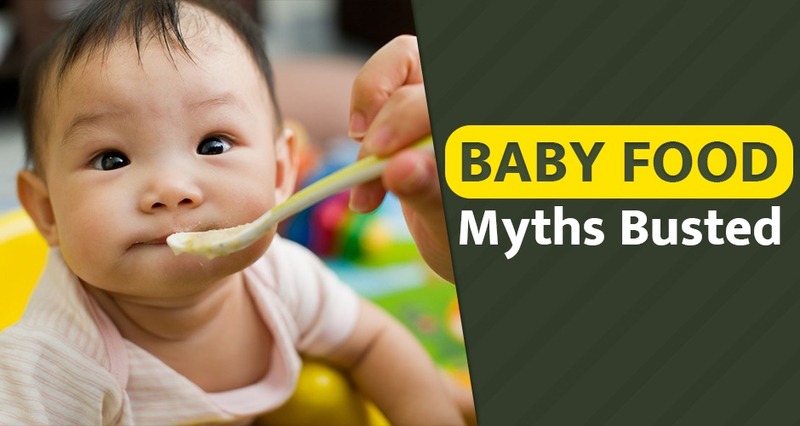 If you too are on the same boat, we are going to clear all your doubts and confusions about baby food myths and help you bust all the myths about baby food. Ready to bust some baby food myths? Let’s go! One of the first things we learn when we read articles about health is just how important Vitamin C is. It is an essential antioxidant that boosts our immune system. Up until now, your little baby has been getting all the antioxidants he needs from your breast milk. However, oranges are not the richest source of Vitamin C. Kiwis and guavas actually have more Vitamin C content than oranges do. While you may not want to start with spices and masalas right after your baby starts weaning, waiting a few months and introducing them to masalas might make their meal time better. Babies develop food preferences early on. Breast milk tastes different from mother to mother and even different cultures and households. For example, if a breastfeeding mother’s meals contain flavours like garlic, ginger, cumin and other such spices, the baby gets accustomed to a certain taste. So, for your baby’s next meal, adding a dash of cinnamon powder might make it quite delicious. Most parents start weaning their babies with mashed and pureed vegetables and only then graduate to introducing fruits as they believe this is the healthier option. Some parents follow the same pattern because they are worried that their babies will enjoy the sweet taste of fruits so much so that they will dislike the taste of vegetables. However, there is no evidence to support the claim that babies will only love fruits if fruits are introduced to them first. Most parents or adults who have spent some time with kids will attest to the fact that sugar makes kids quite active and hyper. However, scientists at the National Institutes of Health (NIH) in the USA have come to the conclusion that refined sugar may only affect 5% of very young children with ADHD or children with food allergies. While it’s definitely the easier way to feed a baby who has been weaned for a few months, the nutritional value of fruit juice is never the same as that of the actual fruit. Yes, 100% fruit juice does contain vitamins but it is not equivalent to whole fruits and vegetables which also has a rich fibre content. If you do want to give juice to your baby, the best way to give it is by watering it down by 50%. Just because children will lose their teeth and new ones will come again doesn’t mean you should neglect it. Chocolates and sugary processed food might be something that your older toddler might have gotten used to, but just because his decaying teeth will fall off doesn’t mean you should encourage the habit. If baby teeth fall out or are taken out before the right time, it can really affect the positioning of the permanent teeth. It may come as a surprise but eggs are considered to one of the most common foods that cause allergies. While it is not the worst food for babies, most doctors recommend parents to wait awhile before introducing it to babies. For babies who are 6 months, start with a well-cooked egg yolk and wait till your baby is a year old before giving her the whole egg. No, this is definitely not true. While many babies may have allergies to cow’s milk, or other things like soy, wheat and eggs, it doesn’t mean that the allergies will last forever. By the time your baby is 3 years of age, he may outgrow common food allergies. If they do not outgrow these allergies by the age of 3, there’s a chance that the allergy will disappear by the time they are an adult. Consult your doctor immediately in case of excessive allergies. It is commonly believed that dairy products increase the production of mucus. However, studies have shown that milk is not associated with an increase in cold symptoms or mucus production. So, it is okay to give your baby dairy products while he has a cold, unless he is lactose intolerant or he has an underlying lactose allery which is causing the cold. While it may give your baby time to really understand the food and get a hang of the flavours, feeding your infant a different blend of new foods is one way to help him develop his taste buds faster.